SKB Trap ATA Stand Case with Wheels - holds Audio and Lighting Stands up to 36 1/2 x 11 7/8 x 8 1/4"
Product #20462 | SKU SKB-H3611 | 0.0 (no ratings yet) Thanks for your rating! 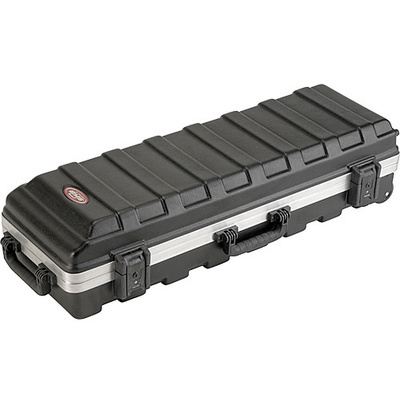 The SKB SKB-H3611W Trap ATA Stand Case is carry and protect lighting, audio and sports equipment. The case is rotationally moulded with slide-in cap design for compact shipping and storage. The computer design provides roto-moulded indestructibility in a rolling stand and hardware case. There are in-line skate wheels installed for easy transport through busy airports and a moulded-in sure-grip handle that balances the case while carrying or loading. The SKB-H3611W is fitted with three interior polypropylene straps with spring loaded reverse-cinch buckles for holding drum stands and hardware securely in place. The interior is fitted with three polypropylene straps with spring loaded reverse-cinch buckles for holding drum stands and hardware securely in place. Moulded-in bumpers protect latches and hinges from damage. Latches, handles and wheels are field replaceable. Moulded in sure-grip handle balances the case while carrying or loading.